Each year, QAHN is pleased to present the Richard Evans Award to a group of volunteers or organization in the historical / heritage sector that has made outstanding contributions to its community and to the celebration and preservation of our collective memory. 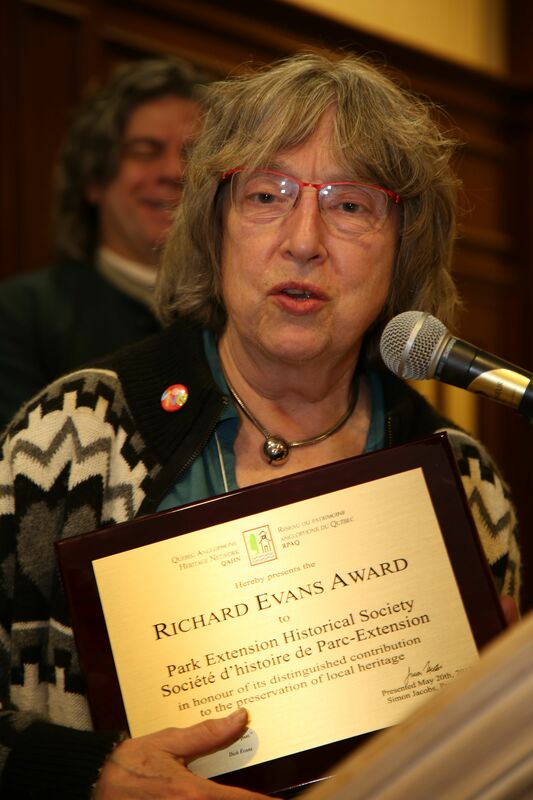 This year we have chosen the Park Extension Historical Society of Montreal. The Park Extension Historical Society has been an active heritage organization in Montreal since it was founded in 2009. It has thrived in one of Montreal’s most multicultural and multilingual neighbourhoods by combining the study and celebration of over 100 years of development with the community’s present reality. On the historical society’s excellent web site (www.histoireparcextension.org), there are detailed accounts of numerous and varied activities undertaken by PEHS since its inception. These include a study of local built heritage (2016), featuring important structures like the Jean-Talon Station on Ogilvy and numerous Art Deco civic and residential buildings from the 1920s and 30s. Park Extension’s history extends from its original farming heritage (including an area called the Piggery!) to its most recent project for 2017, (for Montreal’s 375th) -- a several months long collaboration with the Outremont Historical Society for events relating to the former CP rail yards. This will entail exhibits, films and walking tours. The historical society has archives that are available both online and in hard copy. These include vintage photographs, newspaper articles, and more. There is also an oral history project, completed in 2010.
history of Park Extension. The posters from Park Ex’s 2010 centennial are available, as well. Every year, Park Extension Historical Society has hosted an annual supper and conference, featuring different cuisines that reflect the cultural origins of Park Ex’s residents. In 2016, there was a Pie Festival with multi-ethnic pies. All of the historical society’s activities focus on encouraging participation from the community. The Park Extension Historical Society holds regular meetings at the William Hingston Centre, 419 Saint-Roch, Montreal, Quebec, H3N 1K2. The historical society’s two email addresses are: info@histoireparcextension, and info@parkextensionhistory.org. The society’s president is currently Mary McCutcheon.